St. George’s Basilica is located at the Jiřské náměstí and it is one of our most significant Romanesque monuments as the second oldest Prague church established around 920 by prince Vratislav I. In 925, the remains of the murdered princess Ludmila were deposited here, the grandmother of St. Václav and the first Czech martyress. When the neighbouring St. George’s Monastery was established in 973, the temple was extended and re-built into a three-aisle basilica in an Oton’s, early-Romanesque style. After the fire in 1142, the basilica was restored by the mother superior Berta nearly to its present appearance. Two white towers of arenaceous marl with stone roof and two rows of Romanesque windows were added to the side aisles in the East. The thinner, Northern tower was called Eve, and the wider, Southern tower, built above the original separate chapel, was called Adam. Eve is slant, and was reinforced during the 70s in the framework of construction works. In the first half of the 13th century, the Chapel of St. Ludmila with her grave was added. Until 1055, the Basilica served the purpose of the official Premyslid dynasty burial grounds, before the St. Vitus Church was built. Prince Vratislav is buried here, as well as prince Oldřich and Jaromír, probably. In the crypt, accessible via a Baroque staircase, there is a black statue of Brigitte as the symbol of human inconsistency and frailty (depicting a maiden body post mortem). The remains of a Romanesque wall painting are preserved on the choir vault as well as in the neighbouring St. Ludmila’s Chapel. Regarding the original Romanesque furnishings, there are preserved parts of a relief with Madonna crowned by the angels, kneeling mother superior Mlada and Berta, and on the side, there is Přemysl Otakar I and his sister, mother superior Agnes (Anežka). The view of the end of the ancient basilica from the Jiřská Street is the most impressive. The church portal in the Jiřská Street was made by the Benedikt Ried smelting plant around 1520, decorated by a view of a knight fighting a dragon in the frontispiece. In the 14th century, a new front face was built in the West, modified in the 17th century in an early Baroque style with a typical terracotta facade. The front face is decorated by a sandstone statue of the founder of Vratislav I Church and the foundress of Blessed Mlada Monastery; the author probably being Jan Jiří Bendl. In the years 1718 - 22, František Maxmilián Kaňka added a baroque Chapel of St. John of Nepomuk in the South-Western corner, which was built to celebrate his beatification. On the front face, there is his statue with angels by Ferdinand Maxmilián Brokoff; the interior was painted by Václav Vavřinec Reiner. The South wall of the main aisle houses a series of paintings with the theme of St. Voršila’s martyrdom and 11 000 of Christian virgins by H. Burgkmair from the 16th century. There is a monument from the years 1947/48 named „Christ from the Trunk of a Tree“ by Otto Herbert Hájek in the Northern side aisle; the author donated the monument to the Czech people and to president Havel as a manifestation of reconciliation. During the era of Joseph II, the abolished St. George’s Monastery was used by the army, and the church dilapidated considerably, too. In the years 1887 - 1908 it was reconstructed according to the design of František Mach, who tried to renew the original Romanesque appearance. Archaeological research took place in the church and in the monastery in the years 1958 - 64. 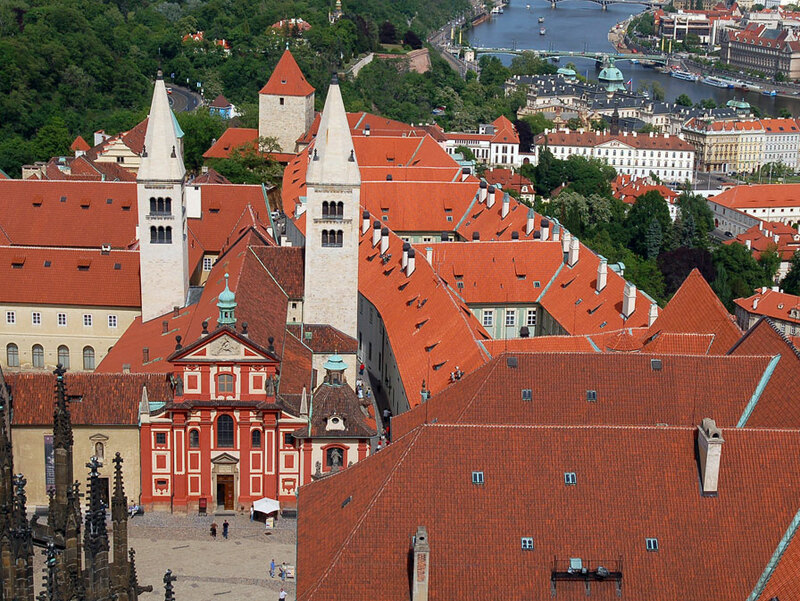 Prague Castle has been a National Cultural Monument since 1962.